Ruins of a fortified Harbour city, during the Canaanite and Philistine times (16th-8th Century BC). 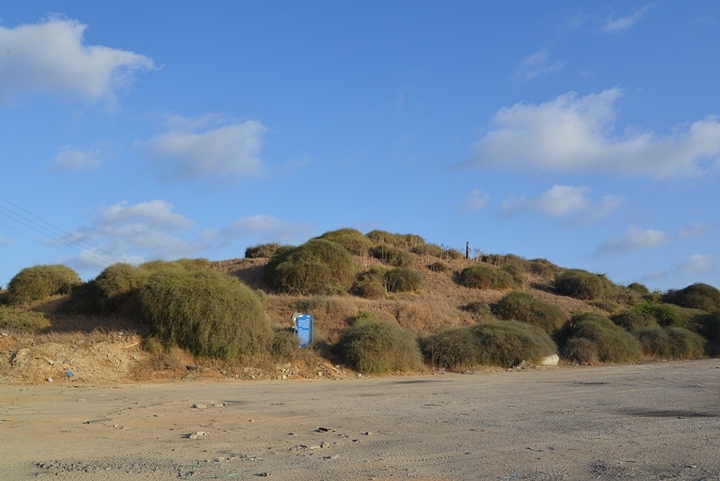 Tel Mor is a small archaeological mound near the mouth of Nahal Lachish river, near Ashdod's modern harbour. During the Canaanite and Philistine settlements of the Bronze and Iron Ages (16th-8th Century B.C. 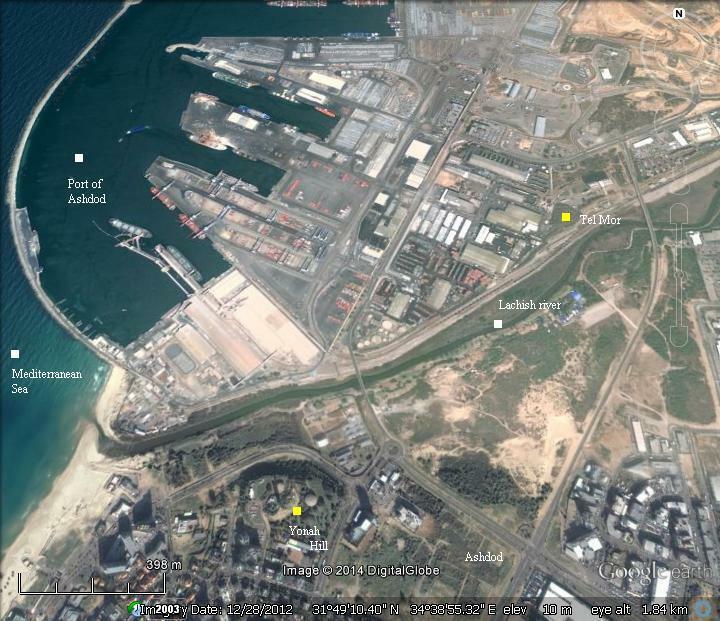 ), this fortified city served as the harbour for the inland city of Ashdod. Tel Mor is located 7KM north west of the ancient inland city of Ashdod. An aerial view of the area around Tel Mor is shown here, with indication of the major sites. Tel Mor was settled at the 16th Century BC (end of the Middle Bronze Age), as the harbor of the inland city of Ashdod. Its location at the mouth of Nahal Lachish river, with its natural anchorage, fulfilled the needs of the city for marine commerce. The excavations unearthed ceramics and artifacts dated to the 16th Century, originated from Cypress, Egypt and coastal cities of the Levant, indicating strong trade activities with the region. According to excavator of the site, M. Dothan, this harbour city and its mother city (Ashdod) may have been constructed during the reign of the Egyptian Pharaoh Apophis I (Apepi), ruler of Lower (North) Egypt during the 15th dynasty (1650-1550). This construction may have associated with the struggle between the Egyptians and the Hyksos (Greek for: "ruler of foreign lands"), foreign invaders who conquered the area of the eastern Nile delta starting from the 18th Century. 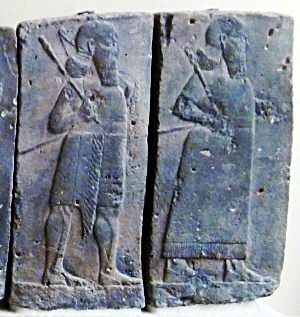 These invaders, Semitic Canaanites from the Levant, seized control of Northern Egypt, pushed the Egyptians to Thebes in the south, and forced the pharaohs to pay tribute. Only after a great war of 30 years, they were finally expelled several years after Apophis. the fortifications of Ashdod, Tel Mor, as well as other cities, may have played a role in this conflict. The fortified city was destroyed at the end of the 14th Century, but soon was rebuilt. A square Egyptian-style fortress (23m x 23m; stratum VIII-VII) was its central structure, with thick walls. This city was destroyed in the middle 13th Century, and a smaller fort (11m x 11m; building F in stratum VI) was built partially on top of it. This also ended in a destruction at the end of the 13th Century. A smaller building (7m x 8m; building H in stratum V) was built on top of it. The ceramics indicated an Egyptian occupation. This construction was not destroyed, but rather fell out of use during the second half of the 12th Century. Some scholars suggested, based on the analysis of ceramics of Tel Mor and Tel Ashdod (as per T.J. Barako, "Philistines and Egyptians in Southern Coastal Canaan during the early Iron Age"), that the Egyptians continued to hold the post of Tel Mor during the early Philistine period. During the beginning of the period, a small agriculture town was located on the mound. The Philistines: The "Sea Peoples" from the Aegean sea landed in Canaan and Egypt in waves of invasions during the 12th Century BC, and settled along the eastern shores of the Levant - a region called "Pleshet", named after the Philistines (Hebrew: Plishtim). The Philistine Pentapolis ("5 cities": Ashdod, Ashkelon, Ekron, Gath and Gaza) were probably established at about 1130 BC. The Philistines became the arch enemies during the period of the Judges (12th-10th C) and the Israelite Kingdom (10th C - 6th C). Ashdod was one of the Philistine main cities, located inland along the Via Maris road. The port city of Ashdod was first located in Tel Mor. However, it small size did not fit the maritime activity of the Iron Age. During the 8th Century the Philistines established a new large fortified port city - Ashdod Maritime - 7km south-west of Tel Mor, on top of a raised mound. It is not known when exactly the transition was made. According to some scholars this was before the Assyrian conquest, while others regard the new site as a new stronghold that was constructed in the eve of the conquest. "In the days of Pekah king of Israel came Tiglathpileser king of Assyria, and took ... and carried them captive to Assyria"). The Assyrians reached Ashdod and made the Philistine cities - from Jaffa to Raphia - a kingdom subdued and raising taxes to the Assyrians. The main city of the Philistine-Assyrian kingdom was Ashdod (the inland city, south of Tel Mor). Sargon II 's intrusion (712 BC): Due to the heavy taxes, the cities of the Levant attempted to free themselves from the Assyrians. They were assisted by the Egyptians, the empire from the south. Ashdod's king, Azuri, stopped to deliver tributes to Assyria. The Assyrians replaced him with his brother, but a commoner named Yamani took the power and refused to pay, and so in 712 the Assyrian King Sargon II (722 – 705BC) came to settle the issue. He also fought the Egyptian army in Raphia, south of Gaza, where he managed to repel them back to the south. During this conquest, both the old and new harbors were besieged and conquered. In the excavations of Tel Mor, the last Iron Age layer is dated to this destruction. Prophet Isaiah writes about this campaign, when Tartan - chief officer of Sargon - conquered Ashdod and its seaport (Isaiah 20 1): "In the year that Tartan came unto Ashdod, (when Sargon the king of Assyria sent him,) and fought against Ashdod, and took it". "Azuri, King of Ashdod, planned in his heart not to pay tribute, and among the kings of his neighborhood disseminated hatred of Assyria. On account of the evil he had done I cut off his lordship over the people of his land. I appointed Ahimiti, his younger (?) brother to the kingship over them. But the Hittites, planning evil, hated him and exalted over them Yamani, who had no claim to the throne, and who, like them, knew no fear of authority. In the anger of my heart the mass of my army I did not muster, I did not assemble my camp. With my usual bodyguard I marched against Ashdod. Yamani heard of the progress of my expedition from afar and fled to the borders of Egypt, which lies by the side of Melucha, and was seen no more. Ashdod, Gath, Ashdudimmu, I besieged, I conquered". "In the 9th [error for 11th] year of my reign I marched to the coast of the great sea Azuri, King of Ashdod, Ahimiti his younger (?) brother I exalted over them tribute and taxes of my lordship like those of kings, I imposed upon them The evil in in order not to pay tribute their princes they drove him away Yamani, a soldier, they appointed to kingship over them. Their city in its environs a moat cubits in depth they dug, they reached the water-level To [punish] Philistia, Judah, Edom, Moab, who inhabit the sea-coast, payers of tribute, and taxes to Ashur, my lord. Planning rebellion and untold evil against me, they bore their pledges to Pharaoh, King of Egypt, a prince who could not help them, and sought his aid. I, Sargon, the faithful prince, who honors the oath of Nabu and Marduk, who guards the name of Ashur, caused my trusty troops to cross the Tigris and Euphrates at high water. As for him, Yamani, their king, who had trusted to his own power, and had not submitted to my lordship, he heard of the advance of my army. The fear of Ashur, my lord, cast him down, and to ... which is on the bank of the river ... waters his land ... far away ... he fled ... Ashdod". After the Sargon II destruction, the Assyrians deported some of the population, replacing them with newcomers. They rebuilt the port city and named it Asdudimmu, preserving the ancient name. However, Tel Mor was not used again as a port. The site was resettled during the Hellenistic period. A public structure was found on the eastern foothills, and an installation for the production of purple dye. The installation included a number of plastered pools and a well full of shells of snails which were used to produce the dye. A small agriculture village existed here during this period. Conder and Kitchener of the Palestine Exploration Fund (PEF) surveyed the area during the Survey of Western Palestine (SWP) in 1874-75. Their map shows the location of Tel Mor, on the south bank of Lachish river (Nahr Sukereir). Tell el Murreh - Across the river is this mound, now named Tel Mor, where the Canaanite/Philistine port was once located. The Arabic translation (per PEF name lists, p. 275) is: "The mound of the brackish water, but perhaps named from the Beni Murreh Arabs". Tell Akhdar - Arabic: the green mound. This is another name of Tel Mor, although it is marked apart of Tell Mureh. Esdud - To the south of the site were the ruins of Tel Ashdod. Via Maris - Sea way - this ancient highway is marked as a double line, connecting the empires on the North to Egypt on the South. It crossed the river at Jisr Esdud (bridge of Ashdod). Excavations at Tel Mor were conducted in 1959 and 1960, directed by M. Dothan. The city of Ashdod was established in 1957, and has grown to have a population of a quarter million (2014). Its port, constructed in 1961 in an area north of the Lachish river, is one of the two main ports in Israel. Tel Mor is located on the north bank of Lachish river, covering an area of 1 Dunam (1/4 acres) mound, rising 25m above sea level. In antiquity the area of the city was larger - 6 Dunam (1 1/2 acres), spreading around the hill, but these ruins were eroded or buried under the ground level. An aerial view from the north west side of Tel Mor was captured by a quad copter. In the center of the mound is a covered observation point. In the left background is the Lachish river and bridge. 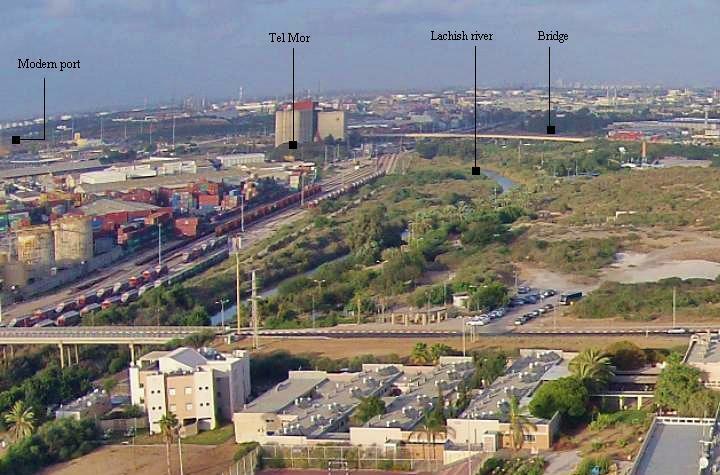 The mound is located inside the industrial zone near the port of Ashdod. This view, captured from the southwest (Yonah Hill), shows the location of the site and indicates other points of interest. The mound from ground level, with a view from the north, is seen here. Twelve occupation levels were identified, covering 7m thick layers. Remains of the Hellenistic-period installation for the production of purple dye is seen in the following photo. This industrial process was based on the medium-sized marine snail (Hilazon in Hebrew, Murex trunculus as scientific name) which was one of the important sources of dye colors in antiquity. The Canaanites, Hebrews of the Zebulun tribe, and especially the Phoenicians produced the deep-purple indigo dye which was used for the textile industry and became a symbol of status, sovereignty and power. The first stage of the extraction of the dye used salt water, while the second phase required fresh water. The installation included a number of plastered pools. Also found were remains of thousands of shells of snails which were used to produce the dye. A deep well, 120 cm in diameter, is located on the top of the mound, which supplied the water to the installation. On the north side of the mound is a road that cut through the Kurkar sandstone ridge. A view of the section towards the north. The edge of the Tel is located near storehouses of the modern port. Archaeology and the Bible (George Barton; 1916) - source for the Assyrian inscriptions.